1. Cultivation. Effective writing requires that one reach a state of internal clarity on such questions as, “Why do I want to comment on this issue?,” “What do I think about it?,” “Am I correct?”—an introspective process that can help us become capable of composing great commentary while also helping you to navigate new and broader areas of life. 2. Expression. Publishing articles gives us—young people who face life with eagerness, who take our lives seriously, who burn with passion for our ideas and our identities—a chance to say it all out loud, to announce both to the world and to ourselves what we find important and why. 3. Impression. Properly done, writing forms a bridge to the hearts and minds of others—others whose engagement, agreement, and fraternity we value and seek to win—and in that way gives our writers a vehicle for changing the world around them. 1.Relevant to our audience. We write primarily for intellectually curious college students and young professionals (with a secondary mind for the broader educated public) and focus our commentary on issues of broad relevance to the lives and values of those readers. That scope includes articles on most national current events and broader cultural trends but does not include narrow technical articles or abstract philosophical treatises. Example: While we would comment on a particular environmental thinker’s ethical framework, we would not comment on highly-technical aspects of that thinker’s research or policy prescriptions. 2. Timely. We write articles on issues relevant to the lives of readers today—issues readers are likely to be hearing about or experiencing in daily life. This is a crucial aspect of relevance and allows us to use current issues as a wedge for demonstrating the broader application of philosophical ideas in other contexts. While there is no ready formula for timeliness, a good rule of thumb is that the more important or popular an issue, the longer it remains relevant (and vice versa). Example: While an article commenting on one pundit’s view of President Trump’s first executive order on immigration was not likely to be timely after the issuance of subsequent orders, an article on Trump’s broader immigration policy likely has a much longer shelf life. 3. Delimited and self-contained. This blog provides writers with a platform for indicating the relevance and application of Objectivist ideas to concrete issues. Thus, our articles must be delimited in scope and self-contained in a way that is both accessible and digestible for our readers. While we are intellectually ambitious, we prefer to make fewer points convincingly than for our pieces to sprawl beyond what can reasonably be achieved in the space of a single article. Example: While we would publish commentary on why Pope Francis’ religious perspective leads to destructive self-sacrifice, we would not publish an article on why there is no God and religion is fundamentally irrational. 4. Expressive of a distinctly Objectivist viewpoint. Our concrete mission is to provide commentary for our particular audience from an Objectivist perspective. That is the unique value that sets us apart from other publications. A good TU article, then, makes a point that is distinctive or unique to Objectivism, as opposed to a point that, while perhaps perfectly valid, could be made by any other source. As a rule of thumb, articles that could easily be written by a conservative or libertarian publication, or that have already been written by others, are probably not right for TU. Example: While we would have published an article on why President Obama’s approach to health care immorally forced individuals to act against their own judgment, we would not have published commentary on the economic tenability of Obamacare. 1. Choose a subject. This is what you want to write about. Take some time to think about your particular philosophical and topical interests, and identify where they intersect. Once you’ve isolated that area, be on the lookout for stories, events, or opinions that can serve as your concrete vehicle for commenting more broadly on that subject. Example: You are interested in Rand’s view that man’s life is the standard of morality, you come from a Catholic background, and you hear that Pope Francis has come out against the death penalty because “all lives are sacred.” The meaning and import of the Pontiff’s position, given your context, is potentially a worthwhile subject. (1) Pope Francis has called for a worldwide ban on the death penalty because, in his view, all lives are equally sacred (link to source). (2) While this appeal seems laudable given recent data on the dangers of faulty incarceration for capital crimes (link to source), does the Pope really have the perspective needed to appreciate these risks? (3) His reasoning is that according to the Bible, even killers have an inviolable right to life (link to source). (4) But do they? It would seem clearly wrong to command that a victim refrain from defending her own life to protect her assailant. (5) And it would be wrong, yet the Pope’s religious standard treats both lives as equally sacred. (6) What this reveals is that Pope Francis doesn’t actually appreciate the value of life, which is why he’s led to mount his opposition to capital punishment on the shoulders of known killers like the Boston Bomber (link to source). (7) This is not a perspective equipped to grapple with the high stakes of capital punishment, nor to present a principled case against it. (8) Such a case, if it’s to be made, must start with an appreciation for life, which entails advocating first and foremost for the value of innocent lives. The propriety of the death penalty must stand or fall on those grounds alone. 4. Draft. Work from your theme and outline to compose a first draft. From here our editors will work with you to hone your piece to completion. This typically involves a few rounds of back-and-forth feedback and edits. The more work you can do to self-edit and to integrate our feedback between rounds, the quicker the drafting process will be. 5. Final edits. Be sure to conduct a series of final read-throughs to improve clarity and eliminate any lingering errors. 6. Get published! Once we approve your final draft, the article will be published on the blog and shared on our social media pages. The post can be attributed to you, or you may elect to write as a “guest” or under a pen name. 1. Choose a subject. This is what you want to write about. Take some time to think about your particular philosophical and topical interests, and identify where they intersect. Once you’ve isolated that area, be on the lookout for concretes worth reporting to our audience. These can include STRIVE Club events, public lectures or debates, political rallies or protests, conversations with public figures, local news stories, etc. 2. Gather information. This is you stepping into the shoes of a journalist. Whether your subject is a STRIVE Club event, a public lecture or debate, a political rally or protest, commentary by a public figure, or a local news story you want to learn more about, go to it. Your goal is to give your audience an accurate sense of what your experience was like. To do that, you need details: attend the event—speak to attendees—take pictures—read the new book—conduct an interview—take copious notes. 3. Choose your format. This is how you want to report the concrete to your audience. You could write up a brief recap describing the event you attended, or compose a personal profile of the figure you met and spoke with, or sit down for an interview with an interesting author or professor, etc. The format you choose should be the one best-suited to conveying the most interesting aspects of what you experienced to readers. 4. Develop a general theme and outline. These are similar to, but less rigorous than the theme and outline for the op-ed. The goal is simply to ensure that you have identified the essentials of your experience that, given TU’s broader mission, are worth conveying to our audience, and moreover, that you have a planned structure for doing that. There is more flexibility on this front than with our op-eds, and our editors will clarify for you the level of specificity required—given the demands of your particular piece—before drafting. 5. Draft. Work from your theme and outline to compose a first draft. From here our editors will work with you to hone your piece to completion. This typically involves a few rounds of back-and-forth feedback and edits, though for our journalistic pieces, far fewer than for our op-eds. The more work you can do to self-edit and to integrate our feedback between rounds, the quicker the drafting process will be. 6. Final edits. Be sure to conduct a series of final read-throughs to improve clarity and eliminate any lingering errors. 7. Get published! Once we approve your final draft, the article will be published on the blog and shared on our social media pages. The post can be attributed to you, or you may elect to write as a “guest” or under a pen name. 1. Choose your subject or read our instructions. The same basic method for choosing a subject applies here, except that we are more likely to publish letters to the editor on topics that we have already commented on or have otherwise expressed an open editorial interest in (say, on our blog or social media pages)—the goal being to feature a running dialogue on our blog or to direct our readers to an opinion of special relevance. If you are submitting pursuant to an initiative, be sure to read the instructions carefully and proceed from there. 2. Draft and submit. Draft your letter to the editor or submission to one of our writing campaigns and submit it to us at editors@the-undercurrent.com. 3. Feedback and edits. Receive feedback from our editors on whether your piece is appropriate for publication and, if so, what final edits might be needed to prepare it for publication. 4. Get published! Once we approve your final draft, the article will be published on the blog and shared on our social media pages. The post can be attributed to you, or you may elect to write as a “guest” or under a pen name. Note that for submissions of this sort, we will likely include a disclaimer that while we are happy to provide interested writers with a platform for engaging with Rand’s ideas, your piece does not necessarily express the views of the publication. 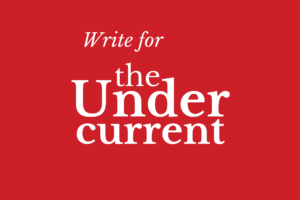 You can always email us at editors@the-undercurrent.com with inquiries or for clarifications.